One of the first things I learned to bake as a child was baking powder biscuits. They remain a favourite to this day; I love them hot out of the oven, slathered with butter and jam. When I spied a jar of Heritage Corn Flour from Barkley’s Apple Orchard in my recent Farmers’ Feast basket from the Ottawa Farmers’ Market, I had a hunch that special flour would make for very delicious biscuits, and that maple butter (thanks to Maple Country Sugar Bush) would be the ideal topping. I was right on both counts. These flaky biscuits are so easy to make and keep well in an airtight container for a couple of days. Piping hot corn flour biscuits taste even better when served with maple butter. Preheat oven to 400F. Line a baking sheet with parchment paper and set aside. Combine the flours and baking powder in a medium bowl. With a grater, shred the cold butter directly into the flour mixture. With two forks, toss the butter and flour together until they are evenly combined. Pour the buttermilk into the flour and butter and quickly stir together with a wooden spoon. Turn the mixture out onto a lightly floured surface and gently knead it just enough to incorporate all the flour into the dough, which will be soft and shaggy. With floured hands, pat the dough out into a rectangle about 1/2 inch (1.25 cm) thick. Using a three inch (7.5 cm) round cutter or a similar sized drinking glass, cut the dough into seven or eight rounds. Place on the parchment-lined baking sheet and bake for 13 – 15 minutes or until tops and bottoms of biscuits are golden. While biscuits are baking, put softened butter in a small bowl. Add maple syrup and stir vigorously to blend together, creating a smooth spread. 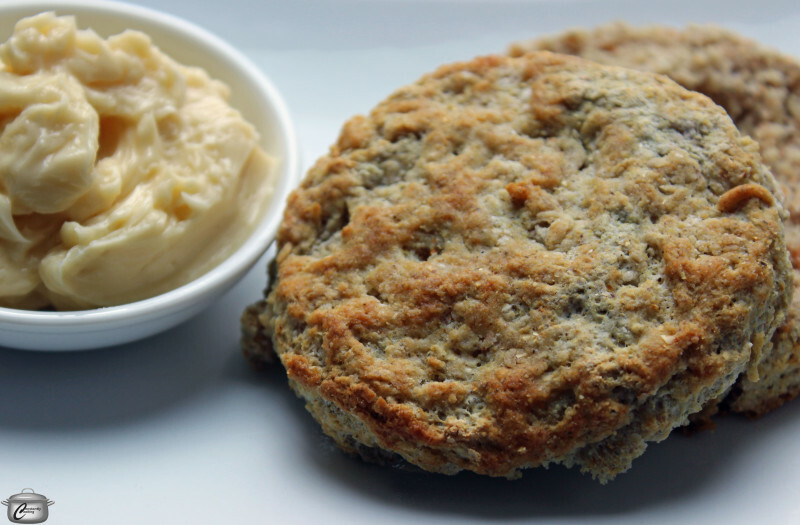 Serve hot biscuits with maple butter on the side. If you’re like my husband, you might also enjoy them topped with a fried egg. 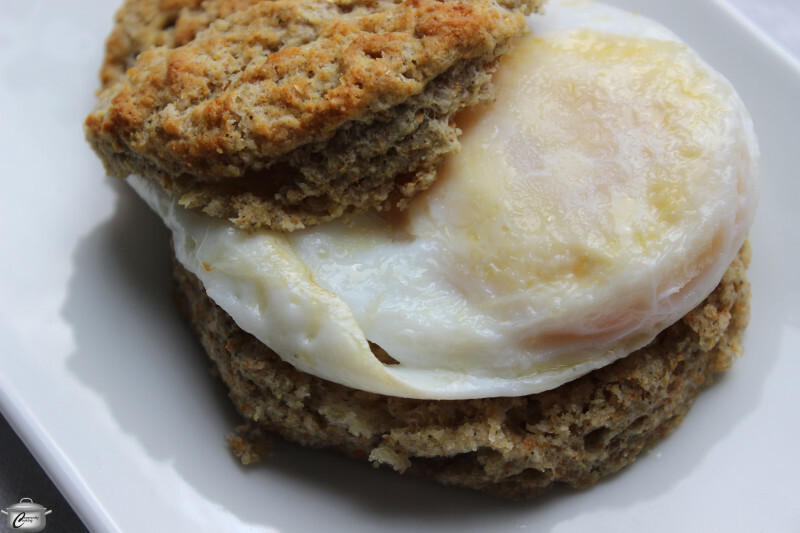 These biscuits are also delicious topped with a fried egg. Makes 7 – 8 three inch biscuits.